Ninety-five years ago, a bunch of ignorant hoi polloi went out into the fields of a small rural town to see a predicted miracle, and the big city MSM was there to laugh at them and to record how the fools would respond when they found nothing happened. Yes, it made headlines, at least in Portugal. It started out as a routine matter: A couple kids saw a “Virgin”, (something that happens all the time in Catholic countries). But this one was different: Because they promised a “miracle” the coming October, and the crowds were there: The ignorant, the poor, the delusional, and especially the educated elites who thought belief in God was passe, and came to laugh at them. But the sun “spun” right on cue, to the astonishment of those present, both believers and non believers. Most of the more recent “sun spinning” phenomenon (e.g.Â at Medjugore) seem to be hallucinations/hysteria, since only the devotee sees it. But this was seen by everyone, even the agnostic anti catholic reporters from the capital, so it doesn’t sound like mass hysteria. Was it a natural phenomenon? Maybe: I read one account that a writer living a couple miles away noted the phenomenon in his diary, so it was probably a natural occurrence. But that’s beside the point. Even if it was a “natural” phenomenon, how did ignorant peasants (or their non scientifically trained local priest, if you think he was the mastermind) predict the day it would happen? Even so, why bother to remember it? I mean, there are a lot of weird things going on out here, as any fan of “Coast to Coast AM” or who watches pseudoscience on the History channel can tell you. Why? Because literally, this miracle changed world history. The “message” from the “virgin” was a routine religious one: the need for Prayer, and repentance/turning from one’s sins. But there were also predictions that Russia would spread her errors around the world, and that some countries would disappear from the map, and that there would be a second world war, preceded with a warning, a “light in the sky”, and if people didn’t repent, an even worse one..but if people turned from their sins, there would be a period of peace. Lucia, the only “seer” who grew to adulthood (the other two died from complications of the Spanish flu epidemic), said she thought Russia was a woman. (Lucia had not gone to school and could neither read nor write when the vision happened). More impressive was the fact that the prediction was made a couple weeks before the Bolshevik revolution in Holy Mother Russia. Of course maybe a local priest with geo political experience made it up, since the prediction wasn’t released until the mid 1920’s, by which time Russia had indeed started to spread the “errors” of communism. But still, most of Russia’s aggression against Eastern Europe occurred much later, after World War II. January 25, 1938 The Fatima Storm – The Great Aurora was seen over the whole of Europe and as far south as Southern Australia, Sicily, Portugal and across the Atlantic to Bermuda and Southern California. Crowds in Vienna awaiting the iminent birth of Princess Juliana’s baby cheered the aurora as a lucky omen. The immense arches of crimson light with shifting areas of green and blue, radiated from a brilliant Auroral Crown near the zenith instead of appearing as usual in parallel lines. 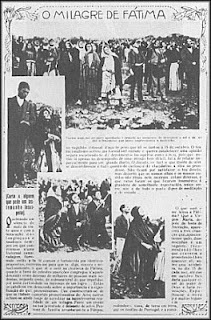 It was also considered to be one of the Fatima Prophesies by Roman Catholics worldwide. So again: Big deal. Someone predicted a solar flare. They happen all the time… the kid (or her machiavellian puppet master) manages to predict two solar phenomenons and guess what would happen in history. Again Big deal. What does that have to do with us? That part has to do with the part about how a third world war could come, but could be stopped with prayer. In other words, another war could be prevented, not by force of arms, but by moral and spiritual weapons. Fast forward to the 1980’s. Communism was seen as the way of the future, and with Jimmy Carter’s failure to be elected, a lot of folks worried there would be world war III started by the cowboy Ronald Reagan. It was the era of economic failure, Soviet expansionism, exploding oil prices and post-Sixties self-loathing in the West. ThatÂ grand fool, J.K. Galbraith, declared that the Soviet system ‘has made great material progress in recent years’ and contrasted it with the West’s failure to ‘make full use of manpower’. ‘Decline’ was the word most commonly used. Yet by the end of that decade, there were only a few communist governments left: the rest fell, often due to peaceful demonstrations by people inspired by their faith. The fall of communism was predicted by nobody back then: and no body predicted that communism would end without major civil wars or worse. Was there a “hidden hand” behind the fall of communism? It is no longer considered respectable – or even, by some, sane – to write what used to be called ‘providential history’. Once upon a time, learned men discerned in great events the working out of divine purposes and arranged their historical narrative accordingly. ‘God blew, and they were scattered,’ it was said of the defeat of the SpanishÂ Armada. John O’Sullivan comes near to saying the same thing about the defeat of Soviet Communism. And yes, God was there: because all three of those leaders were not the ones expected by punits to be chosen to be put into leadership positions, but they were. And all three had survived assassination attempts. O’Sullivan rightly points out that when people have tried to kill you, your attitude to life changes. If you have a strong character, you acquire a heightened sense of purpose. All three of his subjects experiencedÂ assassination attempts, Mrs Thatcher (in the bomb at Brighton) being the only one to escape physical injury. You also tend to think most seriously about your faith. The only moment Mrs Thatcher broke down because of Brighton was when she prayed in church the following Sunday. Reagan believed more explicitly that what he called ‘The Big Fella Upstairs’ had spared him for a purpose. And John Paul thought that Our Lady of Fatima had deflected the bullet, thus saving his life (‘One hand fired and another hand guided the bullet’). John Paul’s belief is not a complete fantasy: it was because he saw a small girl carrying a photo of the Virgin of Fatima, and suddenly leaned down to greet her. And because he leaned down, the assassin missed his vital organs. Coincidence? Maybe. Yet because of these “coincidences” the world changed. Andrew Jackson once said: A man with courage is a majority. So is was only two men and a woman with courage that good is better than evil who dared to tell the bullies they would no longer back down to threats, and encouraged the freedom loving peoples living in slavery under the bullies to show that they were free men. Similarly the Pope, instead of the reaching out to communism or cooperation as was done by his predecessors or the liberation theology types, became a pastor who went in front of his people to say: You are humans with dignity that God gave you. Be not afraid! So there you have it. A “miracle” that changed history. The best film on all of this was made in the 1950’s: best because is is slightly fictionalized to make the story better yet it kept the story true. Yet the idea of Fatima, which linked prayer/know thyself” and “repentance”/the personal decision to live a moral life with the idea that human dignity is offended by political tyranny, has wider implications, as every Filipino knows. Because, after the assassination of Nino Aquino and the Marcos attempt to steal the election from his widow, it was the statue of the Virgin of Fatima that was carried in front of the People Power demonstrations. On February 22, Enrile and General Fidel Ramos, commander of the Philippine Constabulary, issued a joint statement demanding Marcos’s resignation. They established their rebel headquarters inside Camp Aguinaldo and the adjoining Camp Crame in Metro Manila, which was guarded by several hundred troops. Marcos ordered loyal units to suppress the uprising, but Cardinal Sin, broadcasting over the Catholic-run Radio Veritas (which became the voice of the revolution), appealed to the people to bring food and supplies for the rebels and to use nonviolence to block pro-Marcos troop movements. Hundreds of thousands responded. In the tense days that followed, priests, nuns, ordinary citizens, and children linked arms with the rebels and faced down, without violence, the tanks and machine guns of government troops. Many of the government troops defected, including the crews of seven helicopter gunships, which seemed poised to attack the massive crowd on February 24 but landed in Camp Crame to announce their support for People’s Power. Violent confrontations were prevented. The Philippine troops did not want to wage war on their own people. There is an urban legend that the reason the soldiers didn’t shoot was because a “beautiful woman” went over to them and told them “don’t shoot my people”. Nancy Reyes is a retired physician living in the rural Philippines. Parts of this was partly cross posted from her BoinkieBlog. No user commented in " The “Miracle” That Changed History "